DataSpace has worked for the NHS for over 15 years and have experience working with GP’s, Dental Practices and NHS Trusts. This experience has given DataSpace the insight to be able to develop flexible cost saving and efficient services and solutions to meet the requirements of the NHS. DataSpace’s Lloyd George Management solutions provide NHS Practices with the ability to meet Information Governance and Data Protection requirements, utilise space within their practices to it’s full potential and save a considerable amount of Practice staff time. FileLive is DataSpace’s unique online portal where users can request, track and view their items remotely. FileLive users with Management rights are able to track all movements of items and orders processed on the FileLive Management Suite, so you can enjoy all the benefits of having your items offsite whilst continue to have complete control and auditability of your Patients Lloyd George Notes. Why Offsite Lloyd George Management? Our facilities are registered and are compliant with the Department of Health’s Information Governance Toolkit and meet Care Quality Commission (CQC) requirements for Records Management. Our site and repositories are BS5454 accredited which is the provision of Professional Document Archiving and Record Management. DataSpace’s electronic systems are accredited to BS27001 the gold standard for Information Security and BS10008 the provision for the management and storage of electronic data. To view all of our accreditation’s please click here! Imagine if your Lloyd George Notes weren’t in your Practice all the extra space that could be utilised for additional clinics and services. The additional Space currently used for housing Lloyd George Notes could bring the possibility of generating additional income for your Practice. Think of all the time your Practice staff spend pulling and refiling patient records and Lloyd George Notes and how that time could be spent in a more efficient way if physical Lloyd George Management was no longer required. Consider the MASSIVE time saving of DataSpace’s solutions with regards to Solicitors requests, no longer having to scan copies of patient notes at your practice. Could your Practice benefit from your staffs time being used more effectively then scanning Lloyd George Notes. This leads nicely on to our next benefit…..
DataSpace’s Lloyd George Management solutions include Scan on Demand BS 10008 services which is a great way to digitise your physical Lloyd George Notes as and when you require them! 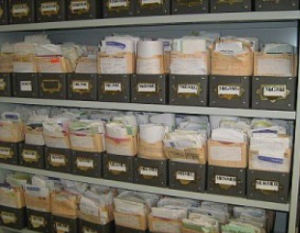 We also provide Bulk Scanning solutions if that is a an option your Practice or Surgery is considering. Full electronic audit trail of the movements and requests of your Lloyd George Notes available at your finger tip 24/7/365 on our secure FileLive portal. 6. DataSpace can assist you with all your Document needs! DataSpace can offer you a Complete Document Solution! Working within a GP or Surgery often leads to generating a high volume of confidential and sensitive paperwork that is why we also provide compliant lockable console bins that we can service for you as regularly as you require. Our confidential shredding services are highly secure and competitive in cost, to request a quote call us on 01606 31115! To find out more about our secure facilities and how our services can work for your Practice call us on 01606 331115 or 0800 028 8956 or email us today at info@data-space.co.uk we look forward to hearing from you.